15 Arlington is located on the NW corner of Arlington and Newbury, with 2 Commonwealth to the north, across Alley 437, 2 Newbury to the south, across Newbury, and 7 Newbury to the west. 15 Arlington was designed by Strickland, Blodgett, and Law, architects, and built by Chase & Gilbert, general contractors, in 1926-1927 for Edward Newton Wyner, a real estate developer also associated with the development of new apartment houses at 6 Marlborough and 100 Beacon. 15 Arlington replaced five existing townhouses at 13-14-15 Arlington and 3-5 Newbury, all of which had been acquired from the Massachusetts Bonding and Insurance Company on July 24, 1925, by real estate dealer William J. Stober, acting for Edward Wyner. Click her for an index to the deeds for 15 Arlington. Edward Wyner is shown as the owner on the original building permit application, dated July 3, 1925. On August 7, 1925, the Board of Appeal granted a variance from the height limits, permitting the proposed 15-story height of the building. As originally proposed, 15 Arlington was to be the Mayflower Hotel. In August of 1926, after the fifteen-floor steel framework was completed, Edward Wyner entered into a long-term lease with the Ritz-Carlton hotels. On September 1, 1926, William Stober transferred the property to the Ritz-Arlington Trust, with Edward Wyner, George Wyner, and John S. Slater as trustees. 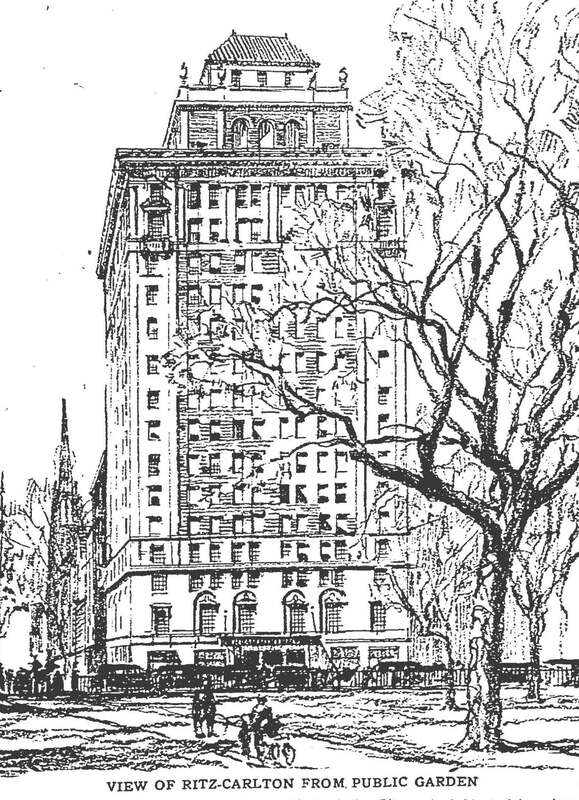 According to an August 31, 1926, article in the Boston Globe announcing the lease, the building would be completed with “some changes … to embody the Ritz service,” including a kitchen on each floor. It was to have 350 rooms, many of which would be suites. 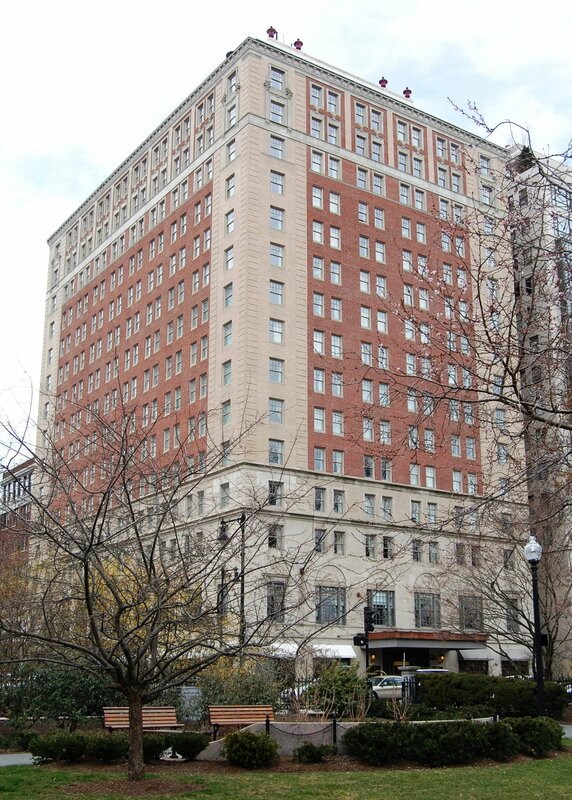 In announcing the lease, George McAneny of Ritz hotels, indicated that they had been interested in a Boston hotel since 1914 but had been deterred by the building height limits. Edward Wyner had been granted a variance permitting a 200-foot structure, which re-ignited the hotel company’s interest. 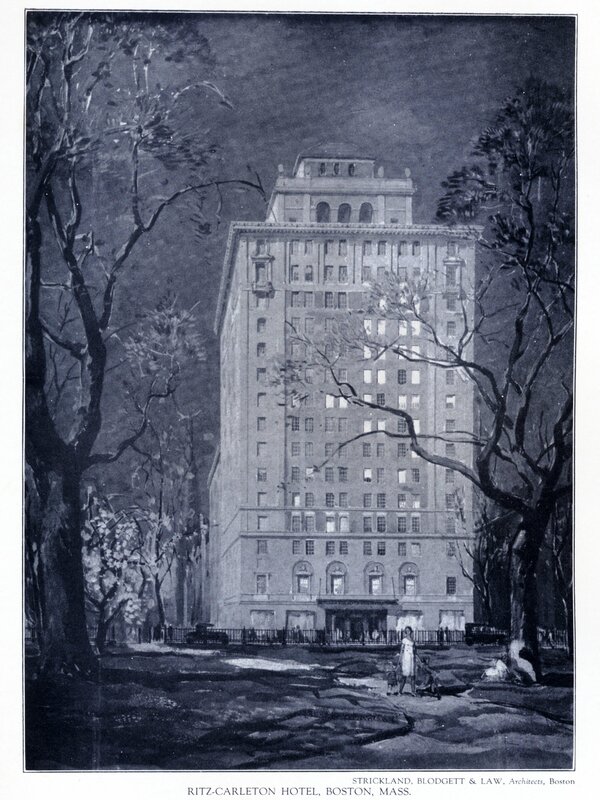 The Ritz-Carlton Hotel opened on May 18, 1927. In its May 15, 1927, article anticipating the hotel’s opening, the Boston Globe described the interior of the new hotel in detail, commenting on (among other attributes) the “dignified and simple” design of the lobbies, the extensive use of imported marble, the elegance of the second floor lounge “reminiscent in design of the 18th century rooms to be found in the New American Wing of the Metropolitan Museum of New York,” and the decoration of the main dining room on the second floor “the conception and color scheme” of which was “originated by Gustavus Tott after a unique European room of the same general character – the dining room of King Ludvig I of Bavaria.” The “showcase of the hotel,” the article asserted, was the Carlu Room on the second floor, designed by the noted French architect and designer Jacques Carlu and his wife, Natacha Carlu, the decoration of which, in modern art deco style, the article described in detail. “In order to harmonize the architecture with the surroundings in this part of Boston, and to get away from the pent-house effect of the ordinary roof, a tower has been constructed on the Ritz-Carlton. “The tower enables the elevators to run all the way up to the roof, and makes feasible a roof garden on top of the hotel. Within the tower has been constructed a modern roof, to serve as an auxiliary lounge. “The effect is bizarre, with horizontal stripes of toned yellow and a blue-green ceiling, spotted with silver stars and gold stripes. “The steel sash and doorways leading to the roof will be furnished with coral shades. The view will be a magnificent panorama of Boston. In April of 1931, Edward Wyner, as trustee of the Ritz-Arlington Trust, applied for (and subsequently received) permission to expand the roof garden into a restaurant, with the remodeling designed by Strickland, Blodgett, and Law. The roof garden restaurant operated until 1944 and did not reopen until 1995. In October 1, 1964, the Ritz-Arlington Trust sold the hotel to the P & G Investment Trust, with Gerald W. Blakeley, Jr., Paul F. Hellmuth, and Paul Cogan as trustees. Gerald Blakeley, Jr., was Chairman and major shareholder of Cabot, Cabot & Forbes, a real estate development company. For the next twenty years, the property was held by various trusts overseen by Gerald Blakeley, Jr. In 1978, he also acquired the US trademark for Ritz-Carlton Hotels. In 1981, 2 Commonwealth was completed immediately to the north of 15 Arlington, built by a another trust overseen by Gerald Blakeley, Jr. The upper floors were sold as condominiums and the lower floors became an annex to the Ritz-Carlton Hotel. In August 25, 1983, 15 Arlington was acquired by the Ritz-Carlton Hotels LP, organized by Atlanta real estate and hotel developer William B. Johnson. He also acquired the US trademark for Ritz-Carlton Hotels. On March 13, 1985, the 15 Arlington property was acquired by RAJ Boston Associates LP. In October of 1999, the Ritz-Carlton hotel lease at 15 Arlington was acquired by real estate developers Millennium Partners from New York. At the same time, they announced plans to build a second Ritz-Carlton Hotel on Avery Street, on the eastern side of the Boston Common. The new Ritz-Carlton on the Common was completed in 2001 and Millennium Partners undertook an extensive renovation of the Ritz-Carlton at 15 Arlington. It re-opened in October of 2002. The property at 15 Arlington continued to be owned by RAJ Boston Associates LP. On September 30, 2005, it was acquired from them (through a deed in lieu of foreclosure) by the MPI Hotel I (Boston) Leasing Company LP, organized by Millennium Partners. In November of 2006, Millennium Partners announced the sale of 15 Arlington and the Ritz-Carlton Hotel to Taj Hotels Resorts and Palaces, based in Mumbai. On January 11, 2007, the property (15 Arlington and the hotel condominium at 2 Commonwealth) was acquired by IHMS (Boston) LLC. 15 Arlington operated as the Taj Hotel Boston from 2007. On May 30, 2016, the Boston Globe reported that New England Development, founded by real estate developer Stephen Karp, and Eastern Real Estate Development were leading a group of investors to purchase the Taj Hotel Boston. On July 11, 2016, Newbury Owners LLC purchased the property (15 Commonwealth and the hotel condominium at 2 Commonwealth) from IHMS (Boston) LLC. In October of 2018, IREP Newbury Hotel LLC announced plans to renovate the building, including moving the main entrance from Arlington to Newbury. 15 Arlington replaced five existing townhouses: 13-14-15 Arlington and 3-5 Newbury. 13-14-15 Arlington were designed by Richard Morris Hunt and built ca. 1860 for Dr. William Walter Morland on land he had purchased from the Commonwealth of Massachusetts on November 27, 1858. When they were completed, he made 13 Arlington his home and sold the other two houses. 13-14-15 Arlington remained separate residences until about 1891, when 13 and 14 Arlington were leased by William E. Blanchard, an insurance broker, and his wife, Mary Frances (Bliven) Blanchard. The Blanchards operated them as a single property, where they lived and maintained a lodging house. In about 1902, the Blanchards also leased 15 Arlington. By 1905, 13-14-15 Arlington were called The Arlington. 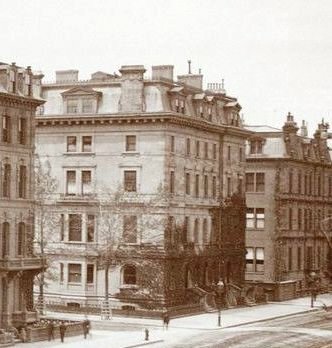 In mid-1901, 13-14-15 Arlington and 3 Newbury were acquired by the Boston Athenaeum, which planned to raze the houses, build a new building, and relocate there from Beacon Street. 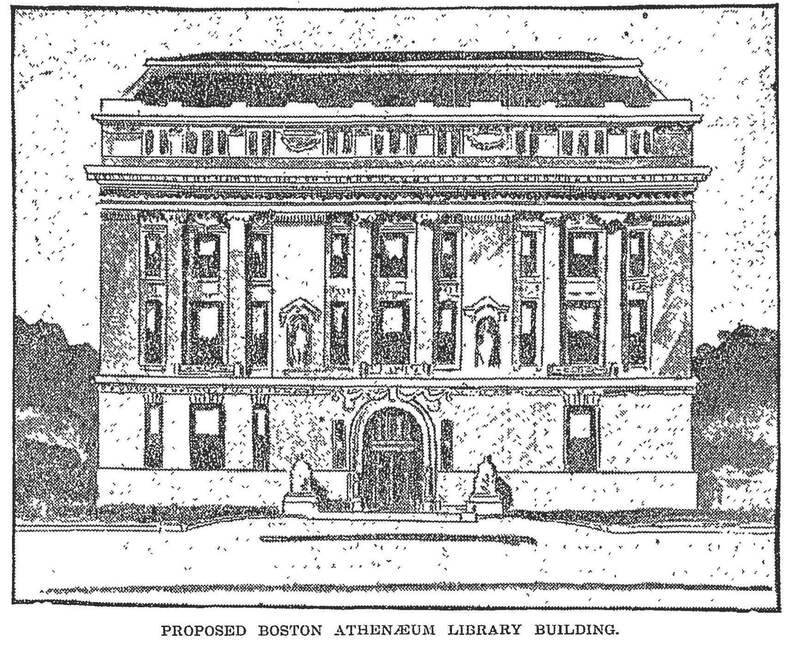 A June 1, 1901, Boston Globe article announced approval of the plan by the proprietors of the Athenaeum, and a July 14, 1901, Boston Globe article reported that acquisition of 14 Arlington was the “last parcel necessary for the site of the new building to be erected by the trustees of the Boston Athenaeum” at the corner of Arlington and Newbury Streets. A May 28, 1902, Boston Globe article reported that the design submitted by the architectural firm of Putnam and Cox had been selected. The Athenaeum subsequently changed its plans and decided to expand its Beacon Street building. The Boston Globe reported on January 28, 1904, that the Arlington and Newbury Street property was up for sale. 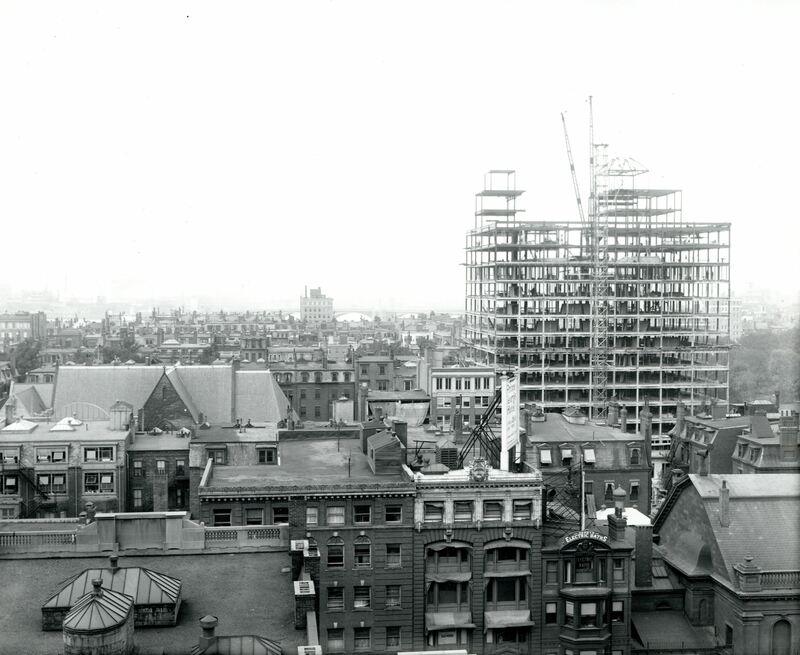 In December of 1910, the YMCA purchased land on Huntington Avenue, next to the New England Conservatory of Music, and announced that its new building would be built there rather than at Arlington and Newbury. On April 10, 1912, 13-14-15 Arlington and the Newbury Street houses were purchased from the YMCA by the J. R. Whipple Company – owners of the Hotel Touraine, Parker House, and Young’s Hotel – which announced plans to build a new hotel on the property. Throughout this period, the Blanchards continued to operate their lodging house at 13-14-15 Arlington. On January 18, 1916, there was a fire in the Blanchards’ apartment. William Blanchard was rescued by two of the tenants, but died a week later. 13-14-15 Arlington were omitted from the Blue Books in 1917 and subsequent years and appear to have been vacant. On July 10, 1919, 13-14-15 Arlington and 3-5 Newbury were purchased from the J. R. Whipple Company by William A. Gaston, an attorney. On January 2, 1920, he transferred the property to the Massachusetts Bonding Building Trust, of which he and others were trustees, and on December 20, 1920, the property was acquired by the Massachusetts Bonding and Insurance Company. On July 24, 1925, 13-14-15 Arlington and 3-5 Newbury were acquired by real estate dealer William J. Stober, acting on behalf of developer Edward Wyner. They subsequently were demolished and replaced by the Ritz-Carlton Hotel. 13 Arlington was built as the home of Dr. William Wallace Morland, a physician, and his wife, Frances Sophia (Lyman) Morland, one of three houses (13-14-15 Arlington) he had built at the same time on land he purchased from the Commonwealth of Massachusetts on November 27, 1858. The Morlands previously had lived at 35 Hancock. They continued to live at 13 Arlington in 1866, but had moved to 90 Charles by 1867 and then to 231 Beacon. Click here for an index to the deeds for 13 Arlington. On October 6, 1866, 13 Arlington was purchased from William Morland by Henry Kenney Horton, a wholesale dry goods merchant. He and his wife, Helen Maria (Barnes) Horton, made it their home. They previously had lived at 12 Marlborough. Henry Horton died in October of 1867. Helen Horton continued to live at 13 Arlington. Helen Horton continued to live at 13 Arlington until about 1870. On October 27, 1869,, 13 Arlington was purchased from Helen Maria Horton and Henry Horton’s estate by Thomas Richardson. He and his wife, Olivia (Alger) Richardson, lived there from about 1870. They previously had lived at 150 Charles. Their son and daughter-in-law, Thomas Francis Richardson and Ellen (Phelps) Richardson, lived with them. Thomas Richardson was part owner of the South Boston Iron Works founded by his father-in-law, Cyrus Alger. He also was a former commission merchant in the Mediterranean trade. Thomas Francis Richardson was an attorney. Olivia Richardson died in December of 1871, the victim of an elevator accident. Thomas Richardson died in December of 1872. Thomas F. and Ellen Richardson continued to live at 13 Arlington until 1876, when they traveled to Europe, remaining there until 1890. When they returned, they settled in Washington DC. By 1877, 13 Arlington was the home of Thomas Mack and his wife, Eleanor S. (Pearson) Claflin Mack. They previously had lived at 4 Park. He was a wholesale dry goods merchant. They continued to live there in 1883, but had purchased and moved to 269 Commonwealth by 1884. On March 1, 1884, 13 Arlington was purchased from Thomas F. Richardson by Harriet (Hattie) F. (Lane) Bartlett. the wife Dr. James Washington Bartlett. They previously had lived in Newton. He was a dentist and he also maintained his medical office at 13 Arlington. The Bartletts appear to have accepted lodgers, and also living at 13 Arlington in 1885 were Charles L. Haskell, a publisher, and Hosea Starr Ballou, a banker. By 1887, the Bartletts had resumed living in Newton and 13 Arlington was the home and dental office of Dr. William Y. Allen. He previously had lived at 56 Boylston and maintained his office at 175 Tremont. Dr. Bartlett continued to maintain his dental offices at 13 Arlington, joined in about 1890 by his son, Sidney Roland Bartlett, also a dentist. In August of 1890, Dr. Allen married Robenia J. Gratz. By 1892, they had moved to 51 Falmouth Street, and he and Drs. James and Sidney Bartlett had moved their dental offices to 2 Commonwealth. By 1891, 13 Arlington had been leased by William and Mary (Bliven) Blanchard, who leased 14 Arlington at about the same time and operated both as lodging houses. They previously had lived at 111 Boylston. On June 22, 1901, 13 Arlington was acquired from Harriet Bartlett by the Boston Athenaeum. 14 Arlington was built ca. 1860, one of three houses (13-14-15 Arlington) built for Dr. William Wallace Morland. He and his wife, Frances Sophia (Lyman) Morland, lived at 13 Arlington. Click here for an index to the deeds for 14 Arlington. On August 30, 1862, William Morland sold a 50 percent undivided interest in 14 Arlington to Henry W. Williams, to whom he also sold 15 Arlington on the same day. On April 1, 1863, Reuben Augustus Richards, a tinplate and metals dealer, purchased 14 Arlington from William Morland and Henry Williams. He and his wife, Annie Frances (White) Richards, made it their Boston home. They previously had lived in Milton, where they continued to maintain a residence. In July of 1876, Reuben Richards was declared bankrupt and his assets, including 14 Arlington, were assigned to William Brandt Storer as receiver in bankruptcy. On May 31, 1877, Annie Richards bought back 14 Arlington from William Storer, holding the property in her own name and leasing it to others. In about 1875, the Richardses had moved to their home in Milton and 14 Arlington became the home of banker Joseph Norton Fiske and his wife, Charlotte (Morse) Fiske. They continued to live there during the 1877-1878 winter season, but moved thereafter to 45 Commonwealth. By the 1878-1879 winter season, 14 Arlington was the home of George H. Carter, an advertising agent, and his mother, Elizabeth Carter, widow of Benjamin Carter. They previously had lived at 83 Pinckney. By 1880, they had been joined by George Carter’s sister, Sarah Dixon (wife of Francis R. Dixon), and several lodgers. The Carters had moved by the 1880-1881 winter season. Among the lodgers at 14 Arlington from about 1880 were Rev. Edmund Farwell Slafter and his wife, Mary Anne (Hazen) Slafter. They previously had lived at 11 Beacon. A retired Episcopal clergyman, Edmund Slafter was an historian and genealogist. They continued to live at 14 Arlington during the 1880-1881 winter season, but moved thereafter to The Thorndike at 91-92 (230-240) Boylston. Mary Anne Slafter died in August of 1886, after which Rev. Slafter moved to 249 Berkeley. Also among the lodgers at 14 Arlington in 1880 were Frederick Augustus (Friedrich August) Haserick and his wife, Minna Emily Hedwig (von Beulwitz) Haserick. He was an importer of textiles and textile manufacturing machinery with the firm of Stoddard, Lovering & Co. They previously had lived in England. In August of 1880, they purchased and subsequently moved to 256 Commonwealth. On July 1, 1881, 14 Arlington was purchased from Annie Richards by George Warren Harding, a wool merchant. He and his wife, Harriet Mighill (Russell) Harding, lived there from the 1881-1882 winter season. They previously had lived in Dorchester. George Harding died in July of 1887. Harriet Harding continued to live at 14 Arlington during the 1887-1888 winter season, but moved thereafter. The Harding family continued to own the property and lease it to others. By the 1888-1889 winter season, 14 Arlington was the home of George Robert Barrett and his wife, Elizabeth M. (Lawrence) Barr Barrett. They previously had lived at 82 Commonwealth. Elizabeth Barrett’s unmarried children by her first marriage — Laura Maria Barr, Caroline Hartwell Barr, James Cummings Barr, and Daniel Lawrence Barr — probably lived with them. The Barretts continued to live at 14 Arlington during the 1889-1890 winter season, but moved thereafter to 275 Marlborough. By 1891, 14 Arlington had been leased by William and Mary (Bliven) Blanchard, who leased 13 Arlington at about the same time and operated both as lodging houses. On July 5, 1901, 14 Arlington was acquired from the Harding family by the Boston Athenaeum. 15 Arlington was built ca. 1860, one of three houses (13-14-15 Arlington) built for Dr. William Wallace Morland. He and his wife, Frances Sophia (Lyman) Morland, lived at 13 Arlington. Click here for an index to the deeds for 15 Arlington. On August 30, 1862, 15 Arlington was purchased from William Morland by Dr. Henry Willard Williams, a physician and oculist. He had married in September of 1860 to Elizabeth A. Low, and they made 15 Arlington their home. Prior to their marriage, he had lived at 33 Essex. Henry Williams died in June of 1895. Elizabeth Williams continued to live at 15 Arlington, joined by several of their adult children, including Helen Williams, Charles Herbert Williams and his wife, Caroline Ellis (Fisher) Williams, and Edward Russell Williams. Charles and Edward Williams were both physicians and maintained their medical offices at 15 Arlington. Elizabeth Williams died in March of 1898. Charles and Caroline Williams, and Edward Williams, continued to live at 15 Arlington until about 1901. Charles and Caroline Williams moved to Milton, and Edward Williams married in October of 1901 to Helen L. Lutz and moved to Cambridge. Charles and Edward Williams moved their medical offices to 1069 Boylston. On July 1, 1901, 15 Arlington was acquired from the estate of Henry Williams by the Boston Athenaeum. By 1902, 15 Arlington had been leased by William and Mary Blanchard, who operated it as a lodging house along with 13 and 14 Arlington.